Earlier this week I got an invite from my newlywed friends to be part of their house painting party, the lure being free donuts, pizza, and beer. Those happen to be 3 of my 4 major food groups, so how could I say no? But before I could go there today I had to take care of a few errands, including picking up my piece from the Belmar show, and my latest batch of slides a few blocks away. By the time I got to the party the donuts were gone, but I was just in time for the other items, and the pizza was the best I had this week. To earn my lunch I was assigned to the crew painting the second bedroom, covering over a mustardy brown color with a light blue called "Heaven on Earth". Looked much better after we were done. The whole thing reminded me that it is exactly one year since we began fixing up the Studio. While our rent began on April 1, the landlord had let us start storing things there a few weeks earlier, and on March 30 I bought the first of many loads of lumber. 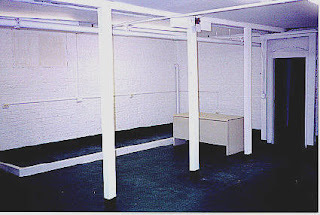 The top two photos show the room as it looked originally- white walls except for the dark green paint on the floor, and the only furniture that one desk. That desk proved to be very useful, as I used its flat top as a base to build all the rest of the furniture. 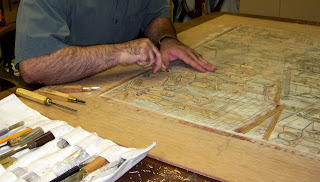 First was my work table, the dark wood one seen in many of these postings. Next was the cabinet units. Each has a laminated top salvaged from a counter/shelf unit that I dismantled behind the bookstore that was disposing of it. 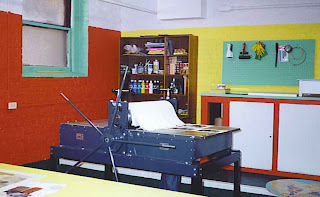 The one with the white doors includes large shelves for big print paper, storage for inks, a large glass ink palette, and Molly's hotplate. The other is open shelves for various supplies. 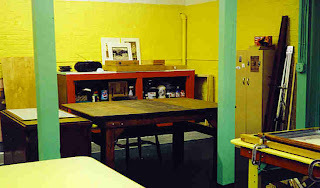 Next came two large work tables mostly to be used by Molly and the print classes. My last construction project was my personal cabinet and inking station, on wheels so I can use it anywhere in the Studio. Meanwhile we had to deal with the painting. The white walls were dull, made it feel like we were stuck in a basement. I talked Molly into the idea of color, gathered the paint chip cards, and sat down with her to pick out what we would use and where. From my list of suggested colors she chose the orange-red, yellow, and green that would be used for walls and trim. 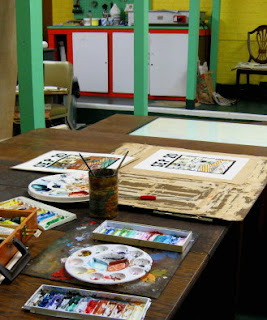 She used the leftover paint to do the cabinets (red) and work tables (yellow with red and green trim). As you can see, 4 gallons of housepaint made a huge difference. It's still a basement, but now a warm, inviting space. I hate to go home at the end of the day. By the way, if you enjoyed these before and after shots of my Studio, you should check out the website for Tugboat Printshop in Pittsburgh. Two print artists have rehabilitated a house into what looks to be a really nice work space for themselves and guest artists. 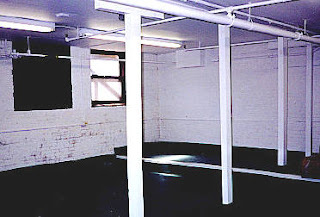 The site includes extensive photos of their rennovations, as well as lots of the artists' work. The last week or so there has been quite a drop-off in attendance in my classes, not uncommon this time of year. I only had half my students in both last night's and today's classes. Not too good. For my Friday students today was the first day of printing woodcuts. My students were few, but they made up for it with some nice prints, as this sample of today's work shows. Whether I'll haul all the printing stuff to class next time, or just bring the next batch of blocks to the Studio to print like I did last time remains to be seen. I used some of my free time today to take care of one bit of business, getting together and mailing my entry for the next Annual Juried Print Exhibition at the Hunterdon Museum. Rules allow work from the past 3 years not shown there previously. Since I haven't shown there since my solo show in mid 2004, that means pretty much everything I've done in the time since is eligible. My two most recent works are out (don't have the slides back yet), but that still left me a lot of options. Sure I decided to go with my recent prize winner, I would have even if it had been rejected from Belmar. 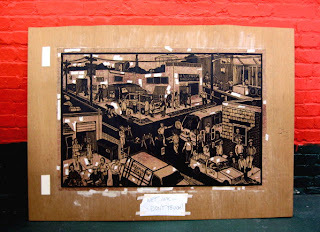 And another print done in the new Studio last summer, the latest supermarket print. (had good luck with those at Hunterdon in the past) For a third I went with a piece from a few years back, a mixed media piece relating to tv dinners. Not knowing the juror's tastes, sometimes I feel it's best to put in a wide variety of work, hoping that at least one appeals to the juror. Results come back to us in about 3 weeks. You'll know when I know. Took a rare Tuesday off to prepare for tonight's appearance by novelist Doug Nufer at the Belmar Arts Council. Although this has been in the works for almost 2 years, I finally met him for the first time when we got together for lunch. His absence from the Jersey Shore all these years left him with some culture shock- the place he suggested to eat was replaced by condos over the winter. After lunch he went off to do more exploring, while I went to the Studio. Mostly it was a drop off/pick up day, but while I was there I put some sealing tape on my box for Tom, and added a little more color to the 2nd St Eustace print. I didn't have my camera with me, so you'll just have to take my word for it. In the evening we met up again at the Boatworks for Nufer's performance. (top photo) Some was acted out, some was read. Featured was his double novel set in our local area, The Mudflat Man/The River Boys. Before and after we spent time discussing some of his use of constraint fiction. This is a writing strategy that requires the author to start with a specific set of rules that must be followed while writing the book. For example, in his novel Negativeland every sentence has some kind of negative construction. His Never Again started with the rule that each word is used only once, then never again. When asked, he said he was very comfortable using constraints and doesn't foresee going back to using conventional writing strategies for novels. I can't get inside his head to know how this helps his creative process, but I have found that setting up structures can have surprisingly creative results. Perhaps the best example of this in my own work is shown in the other photo, an installed (at Kean University) version of my Fourth of July series. 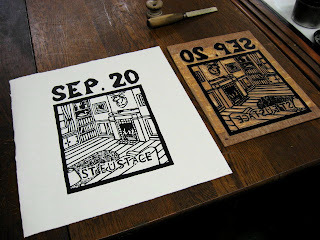 Inspired by Frans Masereel, I created my own autobiographical woodcut novel, with a print for each day for a year, starting July 4, 1993 and ending July 4, 1994. The subject would be something related to that day- something I did, saw, heard about, read about, dreamed, etc. The prints are black and white and identical in size. And while there would be some common themes, no two prints could show the same thing. Some might assume that producing the 366 prints would be an oppressive task, but I found the opposite. Taking the decisions about size, shape, color, and subject matter out of the process let me concetrate fully on choosing the event and designing the composition of the rectangle. Took a lot of pressure off as well. If the day's print didn't turn out to be a masterpiece, no problem, maybe tomorrow's will be better. 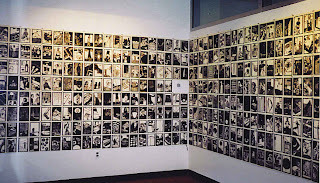 No single print had to carry the whole set, and the lesser images gained meaning from the context of the series. I continue to do prints in series on many occasions because of the advantages- fixed structure, additional layers of meaning, the chance to explore an idea in multiple ways. And if I have an idea that's more suitable for a unique print, I have that option as well. Got up to the Studio late in the day for a little while. There was a stage production in progress, but I was lucky enough to find a parking space near the ceramics studio end. First order of business was printing a few more student woodcuts, blocks from students who didn't have them in class last week. Easier to do it here than bring all that stuff to the classroom. 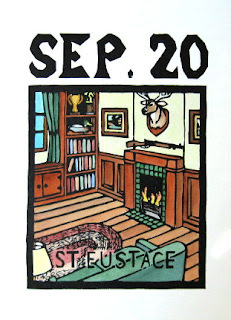 Then I started coloring the 2nd copy of the St Eustace print. Didn't get very far, but there's no hurry. Last thing was grabbing my old CD/radio/tape player for use in class tomorrow, the abstract painting to music exercise. This is the unit I bought to have in my tiny apartment (half the size of this studio) at grad school, and it's still working 15 years later. I'll return it in a few days, and Molly has a radio there as well to see her through until then. The group folio School Days is opening today in a new location, the Hoffmaster Gallery at the Wriston Art Center at Lawrence University, in Appleton, Wisconsin. 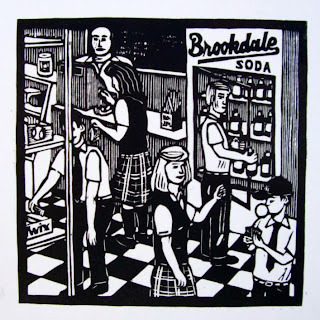 The print shown here was my contribution, about the little convenience store/deli that we kids used to stop at on the way home from school for a soda, candy bar, baseball cards, or whatever. It was known by everyone as Jack's, even though the store had a different name and as far as I knew, no one named Jack worked there. 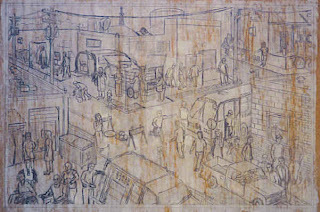 This folio has been exhibited in several locations around the country- St Louis, Mississippi, Louisiana, NYC among others, and is now appearing in its second Wisconsin showing, hosted by Lawrence faculty and folio organizer Ben Rinehart. You can see a preview of the whole folio on Ben's site, but the prints are even more impressive in person, so if you're near Appleton, get to the gallery before the show closes May 6. If not, hope it arrives in a town near you. Always have a lot to do when Thursday comes along, my one half day off during the week this semester. Dropped off my slide film for processing, should be back in about a week. 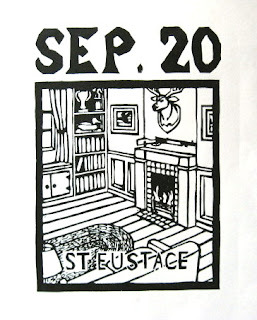 Then up to the studio where I cut loose the copy of St Eustace I had painted and taped down the other copy for coloring. But before getting to that, I decided to take care of a task that needs doing, building a box to ship a wedding present print and some other stuff. Not the St Budoc one from earlier this year, but one for Tom and Anne in St Louis. I couldn't make their wedding, but I did make them an anniversary saint print last summer, my first print in the new Studio. Getting a piece of paper safely across country can be done any number of ways, but I put together one of my custom boxes. 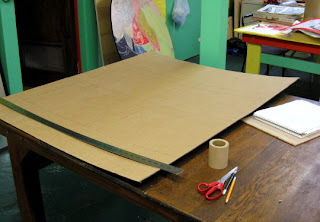 Shown above are the steps- drawing the plan on a flat sheet of cardboard, cutting it out and scoring all the fold lines, reinforcing one side with a scrap of lauan (too damaged to use for a print), folding and gluing the box together with wood glue (the large C-clamps are just acting as weights), and then covering all the seams with paper tape (as it dries, it tightens and strengthens the box). I left it there to dry. Next time I cover the main seams again with clear plastic packaging tape. I'll try to get it out to him next week. Saluki Update- Sad news folks. My Salukis couldn't quite pull off the upset over Kansas, losing by 3 points, despite me wearing my lucky hat (received that reunion weekend in NYC) while teaching. Today is the beginning of the 2007 Southern Graphics Council annual conference, this year in Kansas City. 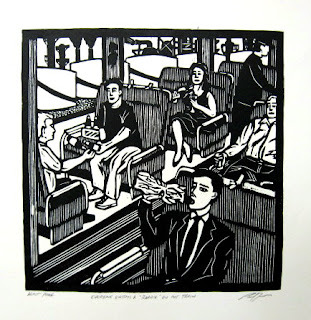 I won't be attending this time around, but I will be represented by this recent print, Everyone Enjoys a 'Roadie' on the Train. I produced the edition this past December to be part of a group folio called "A Clever Means", organized by Nancy Palmeri of UT-Arlington. I don't know exactly where the folio will be exhibitied, but if you're at SGC, look around and it will be somewhere. Lots of cool artists in this one, including some of the Outlaws, so worth pursuing. We weren't given a specific theme, leaving me free to select subject matter, so I chose an idea I've wanted to work with for a while, the widespread open consumption of alcohol on local commuter trains. Not exactly legal sanctioned, not actually prevented either. This is known as having a roadie. After a few days of looking at the colored St Eustace print I have decided that I like it and it's finished. And since this is my last night off before the weekend, it seemed an ideal time to shoot slides of some of the recent work. Slides, like most film based photography, seems to be on the way out in a hurry. Just the other day I asked Tom Huck if he had any spare slides of his recent work to show my students and he was shocked that I'm still using the things. For me it's partly a necessity- the studio classrooms I teach in are not equipped with digital projectors and hookups, so I spend time pulling slides before classes and lug a projector to almost every class. It's not that I'm avoiding digital imaging. This blog is proof of that. The last few juried shows I entered that required mail-in submissions only accepted digital entries, no slides. Mixed results there. I appreciate the instant availability, being able to edit, and the much lower cost of distribution. But I get nervous sending out discs, because I can't physically see the images to make sure they're ok. Just have to hope it works in the next computer. For tonight I'm going old school. Shot a few student pieces, and the rest was various recent prints, all done at the Studio over the past year, including the new St Eustace. I believe it went well, but I won't know for sure until they are developed, a week or so from now. Today is the feast day of St Joseph, patron saint of Italy, among many other things. This has nothing to do with the Studio except that we do celebrate things Italian. 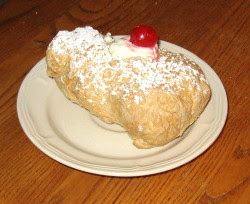 Toward that end I stopped on my way home from class and bought this St Joseph sfinge, a cream puff bigger than your fist, freshly filled with cannoli cream. By tradition, I must eat this tonight. That's just the way it has to be. Actually, there may be a little bit of a print connection. A few years back SGC was in NJ and fell on this day, and I brought a few of these up to the conference to share with the Outlaws, a largely midwestern bunch who are regularly deprived of such treats. But they skipped town to NYC that day to deal with the show we had coming up at Big Cat, so I shared them with the Wash U print kids instead, who were most appreciative. 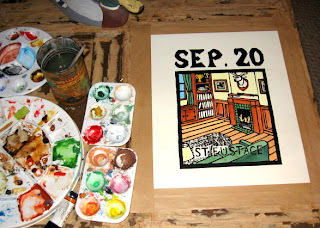 I brought all the watercolor stuff back to the Studio today and finished the first color proof of the St Eustace print. This included coloring those areas left blank on Friday, but I also made slight adjustments to just about everything except the couch. At this moment I think I'm satisfied, but I brought the print back home with me to consider for the next few days. If at that point I don't have any changes to make, I'll declare it done and later this week start coloring my other proof to match this one. The one other thing I have considered is making it later in the day, maybe night, which would require major changes to the light, shadows, etc, which can be very atmospheric, but not traditionally something seen in the Everyman series, and I'd like to maintain certain consistencies in this series. Also big news today is the Salukis continue to roll through the tournament, reaching the Sweet 16. A nice showing for all those who doubted their high seeding. Next up is Kansas on Thursday. As you can see, I had a pretty good day at the exhibition. I arrived right at the beginning when it was still pretty empty, making it very easy for me to spot this plaque sitting under my print. It's not the first time I've taken the top prize in a group show, but the first since 2003. 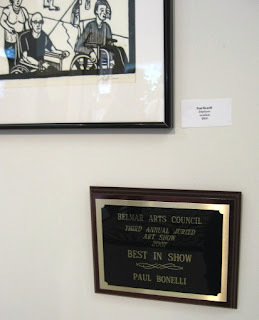 Kind of a surprise, as last week I wasn't even sure I'd be in the show at all, and because mine is the only print in a show full of paintings, juried by a well known painter. But I'm told he was impressed by the technique and the design, and maybe (my guess) he respected it a little more because it's a process he's not as familiar with. As it was, I brought some of those action photos of me working on the block and ended up showing them to a lot of people as they asked for explanations of how the piece was made. I appreciate the honor of the top award, but I try not to get too excited because I'm too aware of the subjective nature of jurying shows and awarding prizes. This was the first exhibition of this print, which had been completely rejected from previous shows I'd submitted it to, forget about any awards. And it's entirely possible that it will get rejected from the next show I submit it to. As an artist you can't get too personally invested in the opinions of jurors, critics, etc. Worry too much about the audience and you start making artistic decisions for the wrong reasons. A lot of bad art has come out of that strategy. Of course, some artists have made a lot of money with this stategy, so decide for yourself if you want to follow my advice. Took care of an early errand up in Neptune this morning. It was raining when I set out, stinging sleet as I was ready to return home. Roads were still not freezing up, so I diverted to the Studio to pick up my watercolor stuff and the copy of the new print that I stretched yesterday. Got home without any further difficulties. As I watched the frozen slush build up on the front steps and street, I knew I would be in for the rest of the day, and if it was as bad as some predictions said, maybe stuck here for a while tomorrow. Lots to do, but in the evening I found time to start the coloring process on this proof. This is as far as I was willing to take it this evening. There's always a big difference between how the color looks at night under incandescent bulbs, and how it will look in the day tomorrow. And this will give me time to consider what's done so far, and what remains. The rug will likely be red tones, to balance the patches of green. The deer head will be colored appropriately, and the books on the shelf will be what makes sense after all the rest is done, likely some neutralized colors. I may also make adjustments to the current colors, but like I said, that decision comes tomorrow. Oh yeah, the Salukis won their first game in the NCAA Tournament. We in the NYC area got to see a whole minute of it. Still, on to the next round. And the weather did ease up and a plow did eventually clear my street, so I should have no trouble making it to tomorrow's reception. My first night of printing student woodcuts went well. Ten students had their blocks ready and we quickly pulled proofs of each. A few samples are shown here. Pretty good for first time cutters working with nothing more than x-acto knives. I may post more in future weeks. Made a brief visit to the Studio today and happened to run into Molly. With our busy spring schedules, it's rare for us to be there at the same time. I told her about the Employee print being in the BAC show and she remembered taking photos of me cutting the block last October. 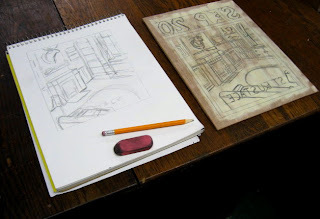 This was before I launched the blog, but she thought readers might appreciate seeing a few in progress photos of the print, so here are three--the inked block in my studio, the original drawing on the block, and one of her photos of me cutting the block. 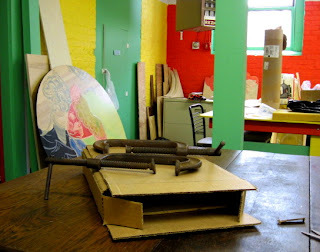 By the way, the reason the last photo was taken was that print/installation artist Anne Dushanko Dobek requested some. 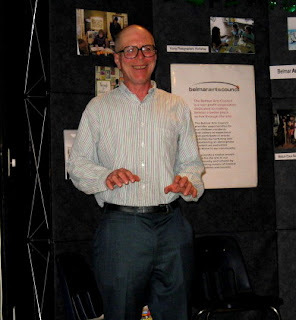 She was doing a lecture on the topic of Printmakers as Social Commentators at NJCVA in Summit, NJ and part was to be devoted to me and my work. She thought the audience would appreciate seeing how my process worked. As it happens, she is scheduled to present her lectures again this spring, including that Social Commentators talk on May 16. To find out more, follow that link and scroll down to 0023. On my way from my day job to my night job I swung by the Boatworks to find out the results of the jurying in the 3rd Annual BAC Juried Art Show. 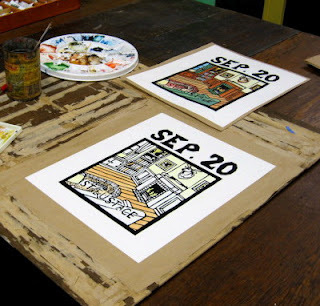 Artists could submit up to two pieces, but a maximum of one per person would be accepted. I dropped off two, so either way I had to come pick up something- I was just hoping I was picking up one instead of both. Installation of the show was in progress when I arrived and I quickly learned that I got a piece in, the one shown above. This is Employee, one of my largest ever prints and my major project from last year. It's 24"x36" and packed full of goodies. 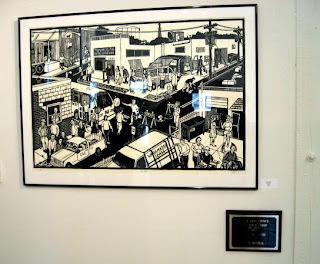 The print is set in a reconfigured version of the industrial park where one of my part time jobs is. One thing I find interesting about this place is that it's the kind of neighborhood where few people come who are not employed there. Not much retail, or restaurants, or any of the things that draw consumers. Buildings are more functional than beautiful. The streets are never quite as busy as this one scene, but it's all stuff you'll find in those couple of blocks. The private joke here is that all the jobs shown are also all jobs (actual or related) I've done for money over the past couple of decades. I tend to identify myself as an artist, but the truth is that I'm a person who has had to work for a living and this isn't likely to change any time soon. 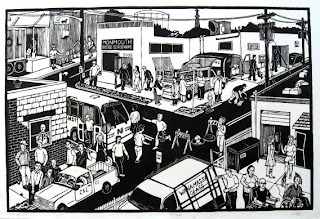 This print is my tribute to that laboring side of my life. The Juried Exhibition officially opens on Saturday, March 17th, with a reception from 3-5pm. Information about the BAC and the Boatworks is available on their website. By the way, here's a proof from today's printing session. I like how it's coming along so far. It's almost nice enough to work with just the black and white, though if that was the plan it would need a bit more black and gray in the composition. My color plans should fill any gaps in the composition. I should get to that by the weekend at the latest. Today is spring break at one of my schools, giving me a rare Monday off. That meant getting back to the Studio to print the latest block. 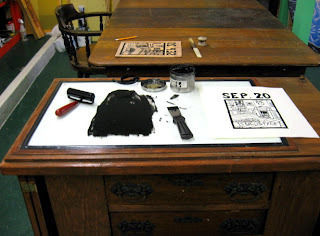 The photos above show some of the action- inking the block, an inky mess at my printing station, and the proof next to its block. This turned out to be an easy block to ink up and print, so I pulled two good proofs and cleaned up. I hung one up to dry and took one home to look at over the next few days. While I was there, I picked up various materials needed for my 2D class to print their blocks this week--water based ink, brayers, ink knife, rubbing tools, small palette, and shop apron. Just in case I don't have time to get back to the Studio before Thursday. 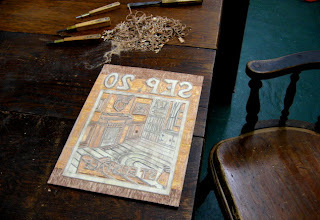 I went back up to the Studio in the afternoon to continue cutting the St Eustace block. Usually on a Sunday I'm the only one in the building, but today there was some activity, mostly related to the next theater production. But other than the occasional visitor to the prop/wardrobe closet across the hall, I had the basement pretty much to myself. Cranked up the tunes, got out the tools, and went to work. Didn't take long to finish the block. I was tempted to print it right then, but it does take a while to get set up and cleaned up, and I still had to do my weekly grocery shopping and get home in time for Selection Sunday (how 'bout that #4 seed for my Salukis), so I settled for just getting the paper ready for next time. I did take a pencil rubbing on newsprint, as seen above. It's still a reversed image, and not quite as detailed as a print would be, but it does give a sense of how the composition is working, and if I missed any spots with my knives. 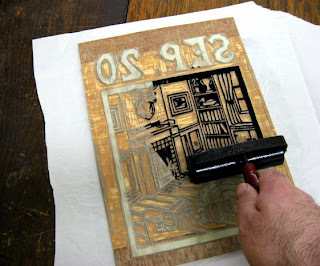 In this case I did make a few minor corrections to the block after seeing the rubbing, so it was time well spent. So far I'm satisfied with what I'm seeing, but proof will come when it's printed. And there are decisions yet to come. At this point I'm not sure what time of day will be shown in the print. Probably afternoon, but night is still a possibility. The coloring would be very different between those two options. Sometimes if I can't decide, I'll try it both ways, then choose which one will be the standard for the edition. In the morning I got a couple of framed pieces ready for the Juried Art Show at the BAC. This is one of those drop off for jurying deals, so I won't know if I'm actually in it until Thursday. I got there toward the end of the receiving period and found a line almost out the door, and work already stacked up at least 5 deep against every wall. Something like 170 pieces came in today. 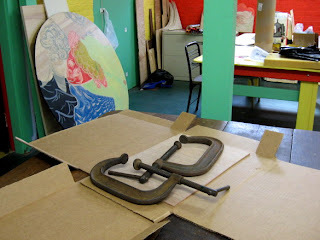 From there I went up to the Studio to continue work on my St Eustace block. 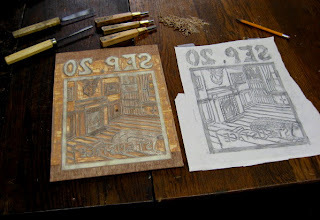 Started the cutting today- date and border first as always, then the name, then began working on the interior scene. This piece of wood cuts pretty easily, so I made good progress in 2+ hours. This image has a lot of architectural detail, and that wall on the left side of the block took most of my time. 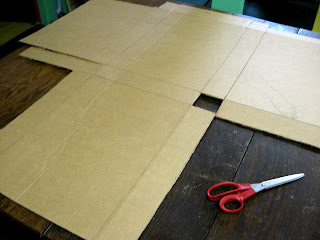 What's left won't be as difficult, so I should be able to finish the cutting tomorrow. I found myself with a little extra free time last night when the community college I teach at on Wednesday nights decided early in the afternoon to cancel all classes after 4 pm due to the snow that had been falling all day. Near me the accumulations were minimal, so I had spent the earlier part of the day working at my sub job, leaving me not far from the Studio around 4, with no reason to rush home. 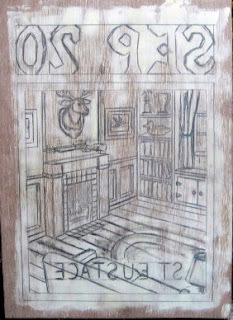 So I stopped by and picked up the St Eustace block to finish the drawing. Normally I would prefer to work on it there, but the building parking lot was still snow covered (unlike all the roads), and with the dance class kids arrival imminent, I figured I should get out fast. That parking lot is bad enough on dance class days when the ground is dry and you can see the space markers. Besides, the reference sketches I had been making for the remaining parts were at home. Late last night I put in some time working on the block drawing, and more this morning, maybe a couple of hours overall. I think it's more or less ready to go, but unless I start it as part of a woodcut demo in my 2D class on Friday, the cutting will wait until the weekend. After a very busy week of working my various jobs, it was great to get back into the Studio and get working on a new print. This will be a new saint print for my Everyman series. The saint prints done since leaving Carbondale have mostly either come about when someone wants a particular date or someone suggests a specific saint because of a story or association. This one falls into the latter category, suggested by my brother, who vaguely remembered a story about St Eustachius (also called Eustace) being reunited with his family. That is mentioned in the biography I found in Butler's, but more interesting is the legend that the former Roman general was out hunting when he saw a stag, and a vision of Christ on the cross between the antlers, and converted instantly to Christianity. As there's a well known Durer print of this scene, I decided not to compete, but still wanted to do something related to the hunting. I went with the trophy head on the wall, the proof of a successful hunt. Considered a classic hunting lodge, but instead went with the idea of a hunter's den at home. Over the last couple of weeks I listed various stereotypical contents of such a room, producing some thumbnails and other scribbles. Today I decided on a floor plan for the room and did a paper sketch. When it seemed workable I repeated it in a more detailed form on a block, along with the feast date. The version shown here is as far as I got. There are some adjustments to be made and some details yet to work out, but it's close. I'll cut next time. A really busy workweek has just passed, which was to culminate in my two 2D classes both starting their woodcut illustration projects. It was hectic getting all my supplementary materials together, but I got it all to the first stop on Thursday and went through the whole thing as expected. 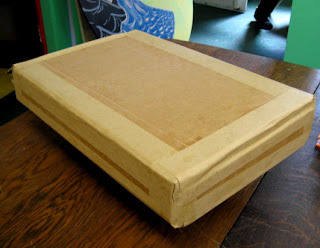 The students got shown a mess of prints in slide form (including some from the Outlaw Printmakers), in books, a few actual prints; and got a demo of cutting and a piece of wood to take home. In class they got as far as sketches on paper, some of which looked very promising. Packed it all up and got it to the classroom for Friday's class, but when I got there it turned out the building was without power. Not that I need electricity to do woodcuts. In fact, here's my I'm Ready for Y2K print, carved on the eve of the event into a log dragged from the woods behind my house with stone tools I made caveman style, just to see if I could still make woodcuts if the potential predicted Y2K problems had caused civilization to collapse. (as it turned out we didn't even lose cable, but it's good to know what can be done) But no power did mean I couldn't show my print slides, and the university wasn't going to let me hold a class anyway in a building without power. Some classes were relocated to other parts of campus, but good luck finding an empty room for a 6 hour studio class. I hung around for an hour or so to let the students (who made it through the rain storm/flooding and up two flights of stairs in a darkened building) know what was going on, which is that we'll just pick up with the same thing next Friday. At that point Security let it be known I had to leave the building, so I was home in time for lunch.